Imagine the worldwide economic power Black people could wield if we practiced group economics. According to a recent Nielsen report, Black buying power in the United States alone is estimated at 1.2 trillion dollars for 2018. The issue is that we circulate those dollars less than one time in the Black community, thereby enriching other communities while crippling Black businesses in the process. 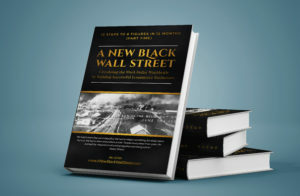 In the early 1900s, Black Wall Street was a thriving community in Tulsa, Oklahoma where we created a plethora of successful Black businesses, circulated the Black dollar in our community, and built true wealth—until it was violently burned to the ground by angry townspeople who resented what we built. Now, we have an opportunity to build A New Black Wall Street that is not relegated to a few city blocks but is worldwide in scope. We must weaponize our Black dollars to fight for equality and justice throughout the world. There is no revolution without economics! This book is designed to help you build a successful ecommerce business, become a producer of products or services, and then market and sell those products or services to our own community so we can start building wealth and begin to “do for self.” I have outlined the concept, provided the knowledge to start your business, and even created a platform to sell our goods to our people at www.BeSmartBuyBlack.com. It’s time. This book is for any person of color who is interested in building a new worldwide Black Economy. It's Time!